A Kroger Express section at Walgreens. Expanding on a partnership announced this fall, The Kroger Co. plans to roll out a curated assortment of grocery products and Home Chef meal kits at select Walgreens drugstores. The companies said Tuesday that the selection of 2,300 products, branded Kroger Express, will “soon be offered” at 13 Walgreens stores, located in northern Kentucky near Kroger’s headquarters in Cincinnati. Along with Home Chef meal kits, offerings will include Kroger own brands — including its Simple Truth natural and organic label — plus national-brand products; dairy, meat, produce and frozen items; and meal solutions. The products were curated using customer data and insights provided by 84.51°, Kroger’s data analytics and consumer intelligence arm. Kroger's Home Chef meal kits are available at Walgreens. Also on Tuesday, Kroger and Deerfield, Ill.-based Walgreens launched Home Chef Express meal kits at 65 Walgreens stores in the Chicago area. Kroger acquired meal kit provider Home Chef in May. The Kroger Express program and Home Chef meal kit rollout build on a pilot that Kroger and Walgreens unveiled in October. In the test, consumers were able to order Kroger groceries online and pick up their orders at the participating Walgreens stores in Kentucky. Teaming up the nation’s largest supermarket retailer and biggest drug chain, the effort aims to promote a convenient, one-stop shopping experience for food, groceries, pharmacy, health and beauty, the companies said. "We are redefining the customer experience in a variety of ways through Restock Kroger, including innovative partnerships like our test-and-learn pilot with Walgreens. We are excited to enter the next phase of the pilot," Robert Clark, senior vice president of merchandising at Kroger, said in a statement. 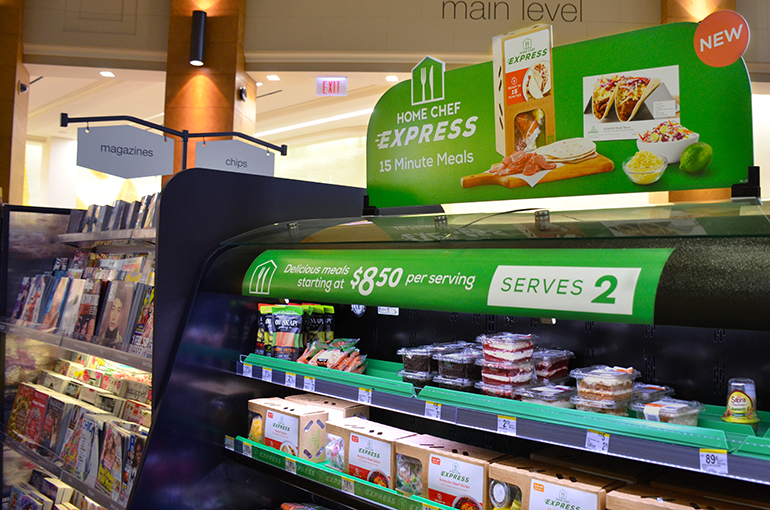 "The Kroger Express concept creates easy access to our most popular Our Brands products through a fill-in grocery shopping experience for Walgreens customers, and our Home Chef Express meal kits provide customers with an on-demand solution for tonight's dinner." Kroger and Walgreens said Kroger Express is now live at the Walgreens store in Florence, Ky. Plans call for the other 12 pilot stores to be up and running with the program in early 2019. "We're pleased to continue working together to explore new concepts that expand product selection to provide a better shopping experience and greater value for our customers," stated Richard Ashworth, president of operations at Walgreens. For Chicago-based Home Chef, the Kroger-Walgreens partnership extends the reach of its meal solutions. Walgreens will carry three exclusive Home Chef Express meal kits, and recipes will rotate biweekly. Each meal serves two people, and prices start at $8.50 per serving. Customers can find participating Walgreens locations HomeChef.com/grocery. Other recipes are available for delivery via Home Chef’s website, where shoppers can find more weekly variety, the company said. “Making Home Chef Express meals available at Walgreens is another way Home Chef is making meal time easy," commented Pat Vihtelic, founder and CEO of Home Chef. "The Express recipes, which cook in 15 minutes, are meals anyone can cook and everyone will love." Kroger began rolling out the Home Chef meal kits across its supermarket banners in October, with the first kits becoming available at Mariano’s stores in Illinois, including Chicago, and at Pick 'n Save and Metro Market stores in Kentucky, Michigan, Ohio and Wisconsin. Kroger to expand the retail distribution of Home Chef meal kits to more markets next year.